Cabinet of the system was painted yesterday. It was tougher work than I expected. 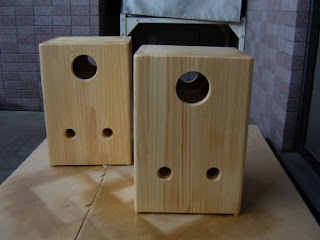 Finishing work is always the most tough part of loudspeaker system assembly. It looks nicer than I expected. I learned about painting recently by commercial DIY video by Loudspeaker Meister Mr. Oyama. It is available in his website. His video is more than excellent than anything else. I wish I could have bought this twenty years ago. I should not have spend hundreds of euros, if I had had this video. After finishing was done, I replaced speaker driver modified FE83E with FE83En, then I was disappointed at the sound. Therefore I made some modification to FE83En. Appearance became different from FE83E. Painting from back side made dirty stain in the front side, while same painting material was used. It seems material of membrane became somewhat different. Sound after this modification was made, impresses me a lot. High frequency does not annoy me as original FE83En. Problem was that low frequency at 50Hz became too strong so that membrane hit limit and made noise; however it is not problem for home use. I do not recommend any one to make same modification. 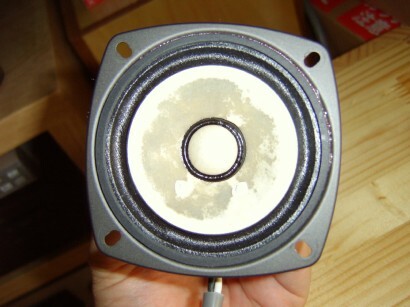 It will spoil the speaker driver unless user love this result.